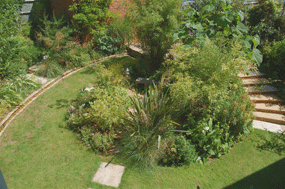 A small garden with a significant slope. Here the clients wanted to remove the grass, create planting beds that are easily accessed for maintenance and to use shallow steps to transition the height changes. The photographs showing the new terraces were taken immediately after planting. 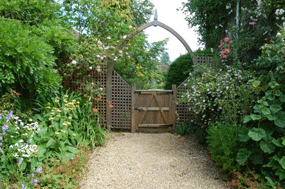 A medium sized garden with a fairly traditional planting mix of shrubs and herbaceous perennials. 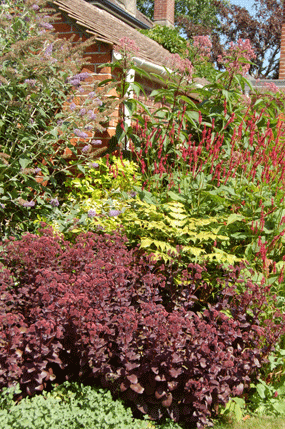 Here in the first season after planting the herbaceous plants are already making a good show; it generally takes a little longer for the slower growing shrubs to catch up and form the balanced framework within which the perennials will later be displayed. Initally an open garden with little planting (first image), these pictures, taken towards the end of the first full season after planting, again illustrate how quickly a difference can be made. 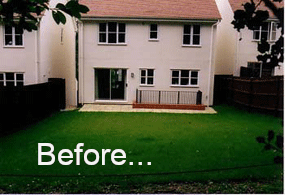 The first picture here shows the garden behind a newly constructed home before any design work. The main challenges in this case were provided by the awkward slope and the garage building which together dominated the view from the house. Two years after construction the garden is split up to create routes around and across the garden, together with several different seating areas. 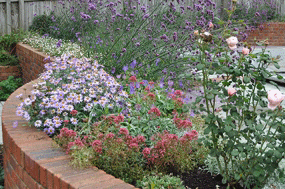 Importantly the slope has been tamed and the view of the garage softened by the abundant planting. 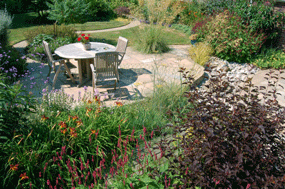 In contrast with gardens 2 and 3, here the planting emphasis is on foliage effect rather than flower colour. 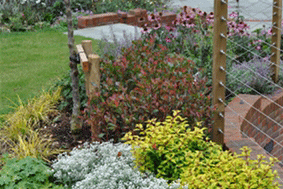 A long and narrow garden modernised with new terracing and shaped planting beds, complemented with contemporary trellis panels. 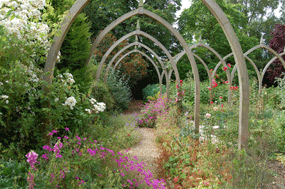 More mature gardens can bring their own challenges. 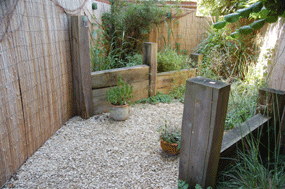 The first picture above illustrates the remaining portion of a previously much larger garden. The available space is now defined by the large conifers which have outgrown the scale of the garden and make it appear much narrower than it actually is. The removal of some of the conifers brought much more light into the garden, allowing a wider range of plants to be grown. A narrow path and a wide lawn now take different routes towards the far end of the plot providing a circuitous meander route around and through the planting. 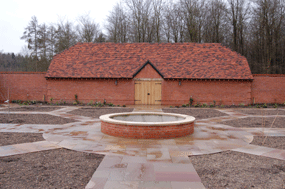 This design was a draft plan for the formal areas of a large country garden. 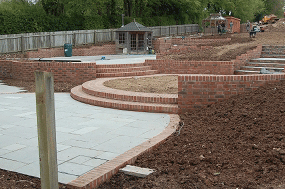 My clients decided to start with the construction of the walled garden, project managing all the work themselves. The walled garden was sited carefully to enable a visual linkage with the existing buildings without compromising critical views of the remaining garden areas enjoyed from the house. 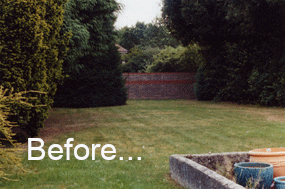 The second photograph shows the area for the walled garden after initial excavations, while those below show the completed structure at the point of initial planting. The walls provide protection from rabbits and deer in addition to support for trained fruit and other climbing plants. 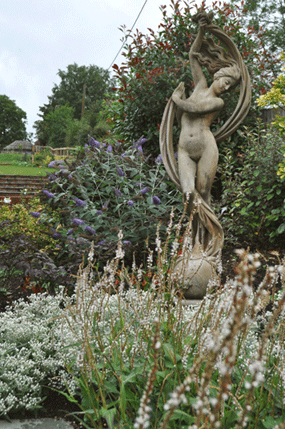 The images above, taken from the same angle, show this garden before work started and at a later stage during construction. Banking around the terrace and fencing around the swimming pool originally acted as a deterrant to enjoyment of this large garden. 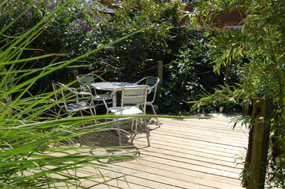 The re-design overcame this by making access to both the pool area and the rest of the garden much more inviting. Wall seats both retain levels and provide occasional informal seating, while wide steps invite exploration to areas beyond. After one full season the planting is already providing ample softening to the hard construction elements. 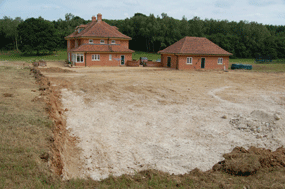 Another fairly typical garden behind a new home, as left by the developers. There is a significant slope to be dealt with and the gardens' aspect means that only the top end of the garden receives the afternoon and evening sun. Not all of my clients choose to make use of the full design service. 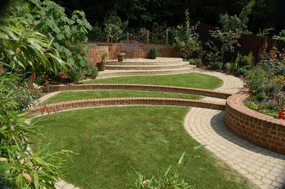 In this case they were keen to carry out their own planting but wanted help getting the structure of the garden right. 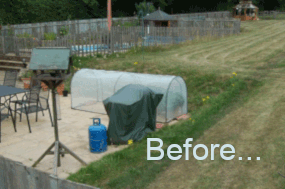 The second photograph was taken just after the construction and plant bed preparation work had been completed. In the second season since handover the clients' planting is beginning to mature. Outside of the courtyard another area was transformed with retaining walls and planting, the second photo showing the area after plant placing but before planting. Not all gardens concentrate focus internally. 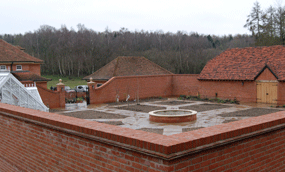 These views illustrate transitional areas between more formal gardens and the wider landscape. 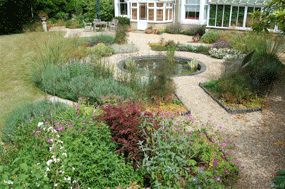 Sweeping rough cut lawns divide areas of wild flower planting and shrub borders in the pictures above, leading the eye towards the large pond. 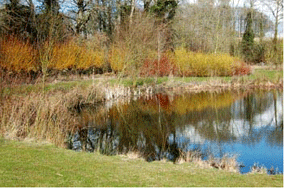 Planting comprises a mixture of native and ornamental trees and shrubs, which rise in scale and merge towards the trees in the countryside beyond. 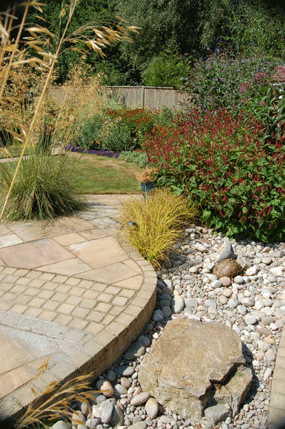 Careful plant choice around the pond ensures winter interest from a variety of bark colours.